Corporate evil taken to its most literal extreme. The nearly 25-year-old Doom 2 has taken to draining the youth from newer games to fuel its apparent immortality. Thanks to the open-source GZDoom engine's continual evolution, classic Doom mods get a little more impressive with every passing year, and Diabolus Ex by mapper Arvell is a fine little example of that. What you're getting here is a single short, sweet but highly explorable level that apes the style of Eidos's Deus Ex: Human Revolution. Perhaps a little on the easy side, but this particular trip to corporate hell is more about the sights and sounds (including a great synth soundtrack by El-Metallico) than the challenge. The level doesn't constrain itself just to the claustrophobic corridors and ventilation crawl-spaces of a demon-infested cyberpunk tower either. There's a brief trip into neon-hued cyberspace around the midway point. Pro tip: While you're there, I'd recommend figuring out how to reach that BFG before opening too many doors. 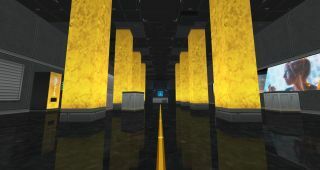 Leveraging GZDoom's feature-set, Diabolus Ex features true 3D environments in its multi-storey corporate tower, polished and reflective wood floors, animated and glowing neon signs and a whole lot of golden twilight glow. If it weren't for the familiar enemies and weapons, this could pass for another game entirely. For those smitten by the look of Diabolus Ex, Arvell also kindly provides Diabolus Ex's texture file for public use on the map's Doomworld release thread. A real treat if you know your way around a Doom level editor. To play Diabolus Ex, you'll need the map itself here, a recent build of the GZDoom engine, and the main WAD data file from Doom 2, which you can buy on Steam here.